This popular gift set gives you a taste of the rugged West Coast - beautiful blush shades and wild rose scents. 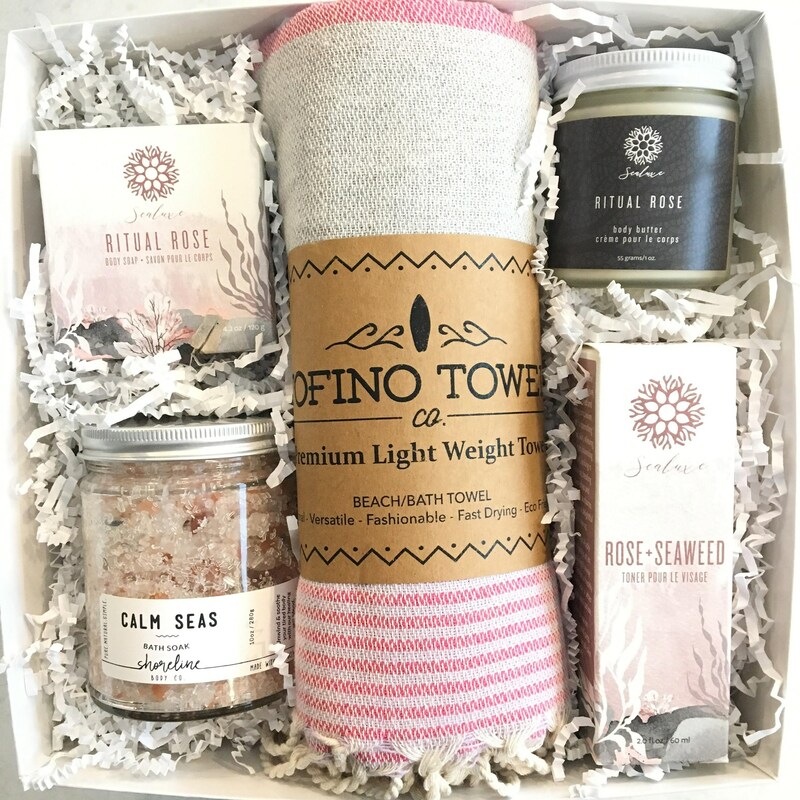 Tofino Towel - inspired by the quaint little seaside town, these gorgeous blush towels from the tidal series are versatile, lightweight towels that can be used at home, on the beach,for fitness, travel or for fashion. Sealuxe - Ritual Rose Body Butter - an ultra-rich cream soaks skin in indulgent, soothing moisture, delivering a healthy looking glow. Only pure and potent ingredients are used in this blend -just use a tiny amount to transform your dry skin into hydrating heaven. Sealuxe - Ritual Rose Soap - a lovely soap bar with shea nut butter and rose clay on top and glycerin soap base with activated charcoal on the bottom. It's the perfect combination for a luxurious cleaning experience. Shoreline Body Co. - a blend of Pink Himalayan, Dead Sea and Epsom salts relieve muscle tension, pain, and inflammation in joints. These along with essential oils of Lavender and Bergamot are also very rich in valuable trace minerals which aid in balancing the pH, hydrating and detoxifying skin leaving it smoother, softer, and cleaner than ever before. Sealuxe - a quick facial moisture pick-me-up that smells divine. Smells like fresh roses and strong enough to use as a perfume or as a natural room spray.